New Barcelona signing Frenkie De Jong is seemingly causing unrest already despite the club only announcing his signing a matter of hours ago. As confirmed by the club, De Jong has agreed to move for Barca in a deal that could cost the Spanish giants up to €86M, with the player set to join up with his new teammates at the end of the season. And, despite only being confirmed as a future Barca player in the last few hours, it seems like the Dutchman is already causing unrest at the Camp Nou. According to Don Balon, a number of the club’s best stars are jealous with the fact that De Jong, who is somewhat unexperienced and young, is getting such a high wage. 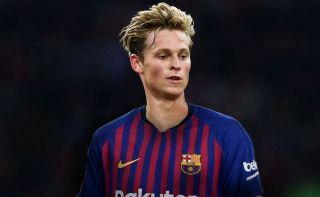 The report states that De Jong is set to rake in €16M-a-year at the Blaugrana, a total that is simply ridiculous for a player who’s only 21 and is still unproven at the top level. Despite all this commotion, De Jong is still a fantastic signing for the club, as the Dutch international is one of the brightest midfield talents in Europe. The player has shown during his career that he will be capable of playing at the top of level of European football for many years, with his displays for Ajax and Holland proving that he’s more than capable of replacing Sergio Busquets in the not-too-distant future. Given how good De Jong could become in the future, all the unrest that his signing has brought could prove to be worth the hassle in the long run.